The first book came out in July 2013, and #5 comes out this October, 2014. Meanwhile, the manuscript for #6 has been written, edited, revised — now it’s up to Feiwel & Friends to turn those rough pages into a real book. I’m proud of this accomplishment. Proud of the quality of these books. Six stories, each unique, with new (diverse) characters and varied settings. Each one designed to get kids turning the pages, reading books, hearts beating faster, and enjoying the experience. As an author, I’ve had to learn to control the things I can, and to accept the process. So much is out of my hands. Will these books find an audience? Will they get past the gatekeepers? Will readers love them? I can only hope . . . while I move on to write the next story that moves me. 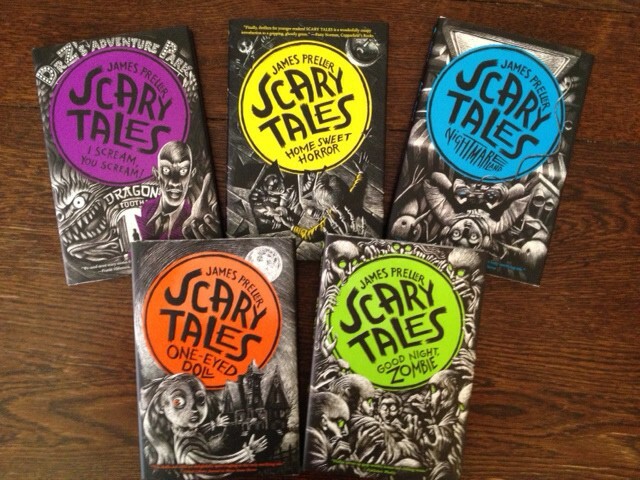 Thank you for giving my “Scary Tales” series a chance. I love those books and I’m fairly amazed that the first one came out only 14 months ago. I haven’t (only) been sitting around! And thanks, too, to everyone at Macmillan for helping to make these books possible. I’ve been fortunate. Oh, yeah: Great books for Halloween, or any time of year! Hey, James, love the new look of your blog! Well done on the Scary Tales series. These are the sorts of books my eldest son used to devour as a child :-)Your new book sounds interesting, and timely. Thank you, Yvette. I still think it needs curtains, but I’ve not been putting quite as much into the blog as I have in the past.